Unsuspecting listeners who aren’t familiar with Turtle Bangs’ music might get the impression they are a country act upon first glance at the cover art of their new album Mountain. However, that notion quickly disintegrates as the ear-splitting fuzz of electric guitar rips into the heavy rock sound of the opening track, “Desert Stone,” which continues relentlessly throughout the set’s entire duration. Guitarist and vocalist Greg Stephen and drummer Casey Carter formed Turtle Bangs in the fall of 2008 while both were residents at Murfreesboro’s notorious Country House. The local duo released their second full-length recording earlier this year, which is a follow-up to their debut, Give Me Your Daughter. Co-produced with Hank Parker Pruett, the album incorporates a profusion of post-grunge, alternative and garage rock elements slightly tempered with hints of punk to create a powerful and beautifully chaotic musical statement. Stephen’s raw and gritty vocal style is at times reminiscent of Kings of Leon’s Caleb Followill, as he delivers each song with reckless abandon that never eases up during the 12 tracks. “Lost in West Virginia/roaming in the cold/mountains overwhelming/waiting for the calm to come,” Stephen intimately reveals in the closing track “Mountain Song.” However, listeners should be forewarned that calm is not something easily heard anywhere on this strikingly frenzied indie rock release. While plenty of passion is evident, these songs are presented in a rough and unpolished, almost demo-like quality that at times becomes monotonous. This fact could hinder some listeners from completing the entire musical journey the duo may have ultimately envisioned. Also, the somewhat less-than-spectacular songwriting contained here only hints at the duo’s promise that is anticipated after hearing the initial tracks. Although Turtle Bangs’ sound may be an acquired taste, the band certainly deserves credit for creating a bold and aggressive album, which is sure to permeate astute rock fans’ ears and give them something to sink their teeth into. 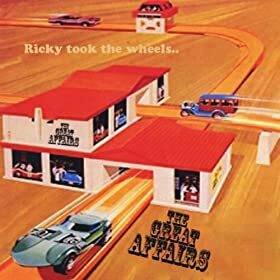 Nashville based pop/rock band The Great Affairs’ latest album, Ricky took the wheels.., is a great affair indeed. This newly released collection of well-crafted songs picks up where their 2009 eponymous debut left off, yet raises the musical bar significantly. The first track, “Feels Like Home,” instantly demands the audience’s attention with its highly addictive chorus, slide guitar, exquisite background harmonies and catchy melody. This is a perfect choice to open with, as it sets the mood for the rest of the album and gives the listener fair warning that great things lie ahead. “In this moment/we’re as young as we’ll ever be/and this feels like home to me,” sings Smith, which sounds as if he is welcoming new and returning fans alike to this musical jaunt. The amps are cranked up on the outstanding “Inside Your Head,” which sums up this album perfectly as it slowly works its magic inside the listener’s head before transitioning to the stripped down “My Apologies.” This somber yet beautiful ballad’s acoustic-based delivery suits Smith’s delicate and heartfelt lyrics perfectly, without becoming overly sentimental, and sits nicely between two rockers. This balance of hard and soft continues throughout this set’s fine assortment of songs. The appropriately titled final track, “Last Good Memory,” provides the perfect ending as the pace alternates between fast and slow, which allows the intensity to build throughout its five-minute duration. “Everything makes me anxious in this dead end town/sometimes I wish the kids would burn it down/I can watch my last good memory fade/and leave me here with just this mess we made,” confesses Smith before bringing the album to a fitting close. Ultimately, it’s the sum of all the parts that make this highly enjoyable album a success. From the inspired lyrics to the excellent guitar work, Ricky took the wheels.. is guaranteed to leave listeners satisfied and anticipating what’s to come from this highly promising band. This praiseworthy recording sounds like a major label deal should be waiting just around the corner. If this album isn’t perfect, then it’s damn close. Recommended tracks to download: all of them.